Greater efficiencies and brighter economics in California agriculture could be achieved by employing conservation principles. The belief that an unrivaled record of productivity, deep soils and dry climate mean conservation agriculture doesn't apply in California is “flat wrong,” said Jeff Mitchell, UC Cooperative Extension specialist in the Department of Plant Sciences at UC Davis. Mitchell, the chair of the UC Conservation Agriculture Systems Innovation Center, made the comment at the 6th World Congress on Conservation Agriculture in Winnipeg, Manitoba, last month. After attending the congress, Mitchell said he is more strongly convinced that greater efficiencies and brighter economics in California agriculture could be achieved by employing conservation principles. The Manitoba congress drew more than 350 participants representing 47 countries. It was co-sponsored by the Conservation Agriculture Systems Alliance, the Conservation Technology Information Center, and the Canadian Soil and Water Conservation Society. 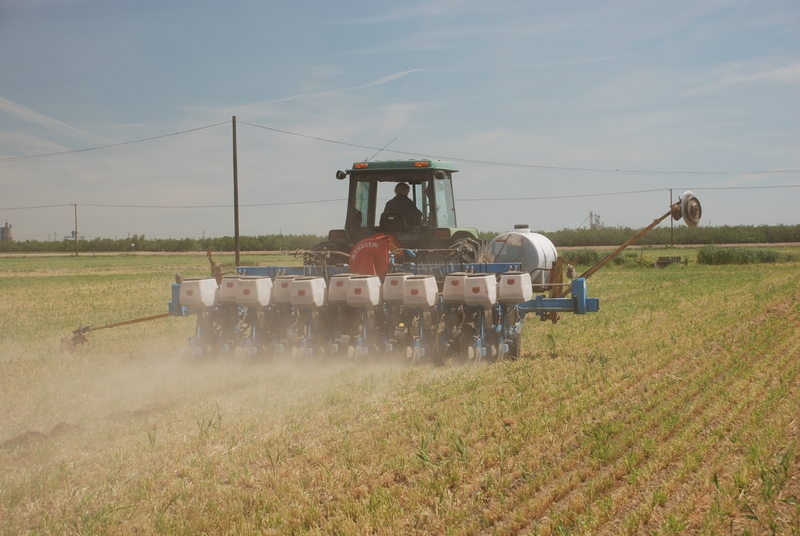 California's CASI was represented by Mitchell and Monte Bottens, president of California Ag Solutions of Madera, a consulting and custom fertilizer support company. Today conservation agriculture is used on about 11 percent of the world's total arable land. Implementation is increasing at an annual rate of about 7 to 8 million hectares, according to the U.N.'s Food and Agricultural Organization. Nearly half of the world's conservation agriculture acreage is found in the developing world. The South American countries of Brazil, Argentina and Paraguay, where the movement had its beginnings as a farmer-led process dating back to the mid-1970s, has about 80 percent implementation. Congress speaker Dwayne Beck, agronomy professor at South Dakota State University, also sounded an alarm. CASI members are working with foundations and granting agencies to better position the organization to support implementation of conservation agriculture in California. 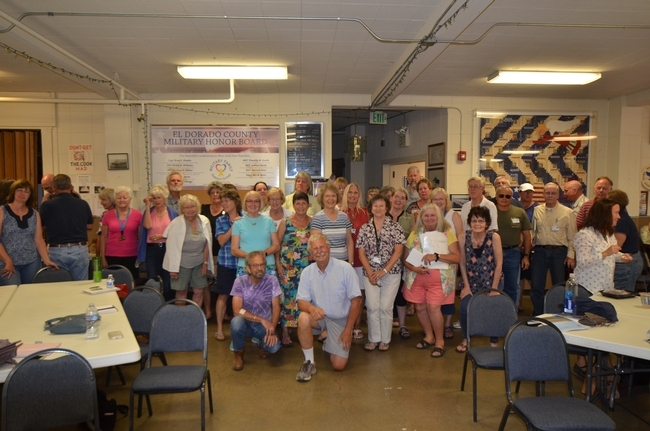 For more information, contact Mitchell at (559) 303-9689. A new center pivot irrigation system at the UC West Side Research and Extension Center was introduced to participants in the twilight field day and farm tour in September. Diminishing water supplies, farm labor shortages, environmental impacts and shrinking agricultural profits are prompting more California farmers to seriously consider adopting conservation practices in their annual row crop production systems. Extensive research by UC scientists and innovative farmers has shown that making the changes can be challenging at first, but in time results in more efficient, environmentally sound and profitable food production systems. “There’s a sense of inevitability now that these systems will be more widely adopted in California annual cropping systems,” said Jeff Mitchell, UC Cooperative Extension specialist in the Department of Plant Sciences at UC Davis. The growing interest was demonstrated at a UC field day and farm tour in September in which more than 200 participants visited three farms already successfully implementing conservation practices and three sites at the field station where research on conservation farming practices is underway. At Five Points Ranch, field day participants stood on an alfalfa field and inched along with an operating center pivot system. Farmer Armando Galvan has added “boom backs” behind the wheels that roll the system through the field. The boom backs make sure the wheel tracks stay dry until the wheels have passed, which prevents wheels from carving deep trenches in wet soil. At the Morning Star dairy farm, John and JoAnne Tacherra irrigate rolling acres of forage with a center pivot irrigation system and have put the employees who used to undertake the punishing task of moving sprinkler sets to work inside the dairy barn. The center pivot system is controlled with the touch of a button. 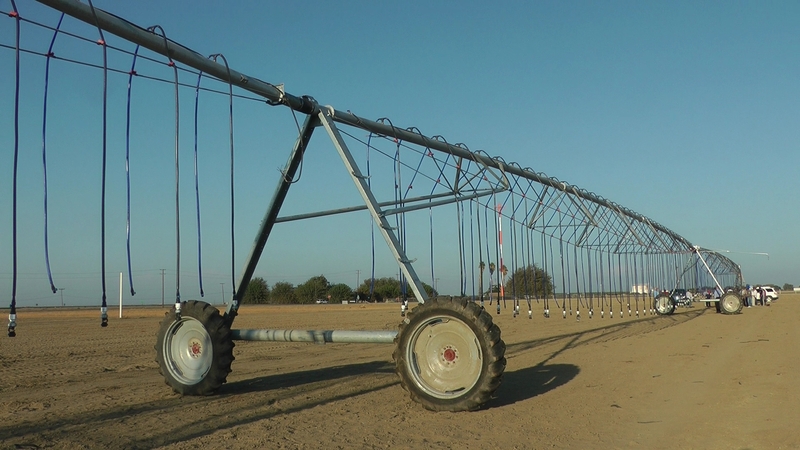 The combination of advanced nozzle packages and software that manages the pivot speed allow the Tacherras to distribute precise quantities of water and dispense the water with the ideal droplet size for each stage of the crop’s development. The couple now plans to experiment with the application of dairy lagoon water through the center pivot system. At Farming “D” Ranch in Five Points, logistics manager Scott Schmidt experienced some problems with overhead irrigation this spring. Water was applied on cotton over triangular beds, slipped into the furrows and left seeds dry. Water infiltration was also inhibited when the wetted surface of the field dried into a crust and subsequent irrigation washed off. The crop had to be replanted. No-till farming and the use of cover crops have been shown at the UC West Side Research and Extension Center to enhance soil quality. When the tour returned to the center’s research plots, they viewed a 12-year study where plots have been maintained to compare the long-term effects of standard tillage techniques with no-till or minimum tillage systems, and both tillage methods combined with off-season cover crops. The soil differences are dramatic. Using clear canisters for a demonstration, Natural Resources Conservation Service soil conservationist Genett Carstensen poured a cup of water onto soil collected from a tilled plot and onto soil from a no-till plot managed with cover crops. The standard till soil repelled the liquid, which pooled at the top of the container; the no-till soil readily absorbed the water. “This is what soil quality is,” Carstensen said. She further demonstrated the soil quality differences by placing dirt clods from the two types of plots in canisters of water. The no-till clod maintained its composure; the clod from the tilled plot began dissolving immediately. At another research field, Steven Kaffka, UC Cooperative Extension specialist in the Department of Plant Sciences at UC Davis, is leading a study of what he calls “energy beets,” formerly known as sugar beets. The trial compares beet production under overhead irrigation and buried drip irrigation. Kaffka believes energy beets will be another competitive crop for California farmers because they can be used to produce ethanol, which will allow farmers to help the state reduce greenhouse gas emissions and achieve climate change goals. The field day also included a glimpse of future research at the northeast corner of the West Side REC where industry donors have teamed up with UC to create a facility for state-of-the-art overhead irrigation study. Reinke Inc. donated a center pivot system, Senninger Irrigation donated nozzles, and Rain for Rent created an infrastructure that gets water and power to the research plot. Replicated plots will be pie shaped and different treatments can be applied to each segment with the use of multiple sets of drop hoses. Studies will begin immediately to research deficit irrigation of alfalfa, corn, sorghum and cotton. “Because of the water situation in California, deficit irrigation is going to be something we will need to know a whole lot more about, for better or for worse,” said Bob Hutmacher, UC Cooperative Extension specialist in the Department of Plant Sciecnes at UC Davis and director of the West Side Research and Extension Center. For the past 20 years, I have taken Elkhorn Avenue just about every day from my home in Kingsburg out west to the small town of Five Points where I work. My travels along this 30-mile rural route have been one of life’s little joys as I have come to deeply respect the people I have met and the things I’ve seen along the way. In many ways, Elkhorn Avenue represents the very best of our Valley and it provides a lot that we might all be proud of. Driving along Elkhorn gives the opportunity to see a number of natural as well as technological gradients. Leaving Kingsburg, you’ll first notice the light-colored, sandy soils that derive from the Sierra Nevada range flanking the eastern San Joaquin Valley. Then, once you cross the trough of the Valley out beyond Riverdale, the soils transition to darker, more finely-textured clay loams that formed as alluvial fans from the Coast Range mountains to the west. These deep soils provide an important part of the natural resource base that has enabled the region’s phenomenal agricultural productivity over the past century. Our Valley’s crop diversity is also apparent along this transition. On a recent drive this spring, I counted over 30 different crops being produced. From permanent trees and vines including almonds to walnuts, to diverse annual crops ranging from eggplant to wheat, a rich array of cropping can be seen along Elkhorn year round. Different innovative systems are now used to irrigate these crops. Flood and furrow irrigation systems have been replaced in vineyards by drip and in orchards by micro-sprinkler systems and recently in annual crop fields by highly precise and uniform center pivot systems that can be seen at the dairy farm of John and Joann Tachara just east of Burrel. Their silage fields are now irrigated and fertigated to precisely match crop needs. Traveling along Elkhorn also brings to mind other innovative farmers. 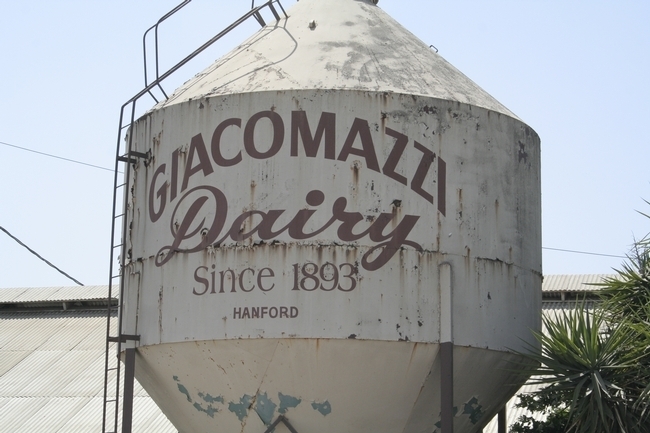 A few miles south on 6th Avenue is Giacomazzi Dairy, a small farm operated by the Giacomazzi family since 1893 and currently run by Dino Giacomazzi, the California recipient of the 2012 prestigious Leopold Conservation Award. 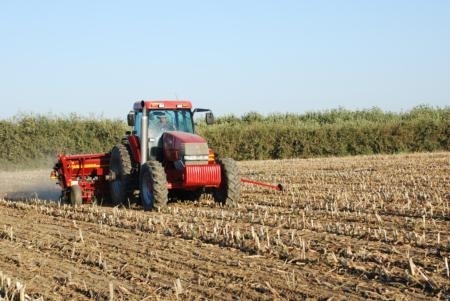 The conservation agriculture practices that Dino has pioneered greatly reduce tractor passes across his fields resulting in more efficient and economical production with fewer emissions. A true example of sustainability if ever there was one. Further west and south of the small West Side community of Five Points is Red Rock Ranch, owned and managed by John Diener. In 2011, John received the Leopold Award for the many conservation techniques he uses to manage salty drainage water, achieve on-farm energy self-sufficiency by biofuel production and processing, and couple conservation tillage with center pivot irrigation. Another example of visionary and sustainable farming. You may also notice smaller scale innovations along Elkhorn Avenue. A group of boys just west of Hwy 43 created their own soccer field complete with metal goal posts. They do all the maintenance for this field themselves and it has become a well used local resource. I also remember seeing two young girls having the times of their lives in their 50-gallon plastic drum ‘pool’ that they had filled with a garden hose. The fun they were having that day with this makeshift little pool brings a smile to my face even today. Looking forward, the future of the agricultural systems that are evolving along Elkhorn Avenue ought to be quite bright. That is, of course, if the region’s other necessary resource, - water, - is made more reliable and available. Creative and visionary water policies and expanded development of efficient water capture, storage, and delivery infrastructure are going to be needed for this innovation to continue. The future of Elkhorn Avenue’s dynamic innovation thus rests with all of us. May we act wisely.